Definition of APC: Any cell that can process and present antigenic peptides in association with class II MHC molecules and deliver a co-stimulatory signal necessary for T cell activation. These cells possess class II MHC molecules on the surface. APCs include macrophages (monocytes as blood macrophages and histiocytes as tissue macrophages), B cells and dendritic cells. 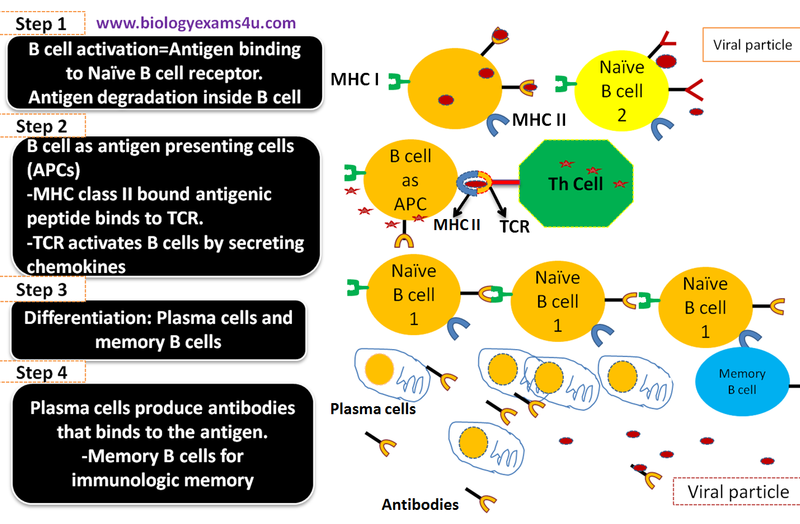 Step 2: B cell acts as antigen presenting cells (APCs). Degrades antigenic peptides are displayed on MHC Class II recetor. -TCR activates B cells by secreting chemokines such as interleukins. Step 3: Clonal selection and Differentiation: That activated B cell divide continuously forming clone of B cells with that specificity. Late these B cells differentiate into Plasma cells and memory B cells. -Memory B cells produced are responsible for immunologic memory. (when the same antigen attacks the body for the second time, memory B cells recognizes it quickly and trigger an enhanced immune response, thus preventing further infection).